Magnolia Gardens is a love story. It is a romantic garden, an effort to re-create Eden. The Rev. John Grimke Drayton, whose Philadelphia-born wife hated the South, spent a lifetime trying "to create an earthly paradise in which my dear Julia may forever forget Philadelphia and her desire to return there." "We work together to propagate old azaleas and camellias. We're saving the DNA," Johnson said. 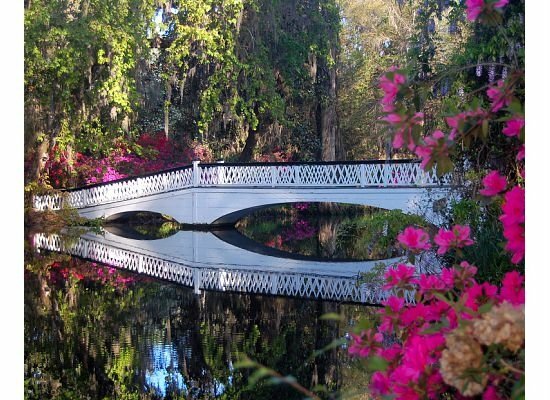 Though Johnson looks far into the future, today's Magnolia Gardens should top the list of must-see places in the Lowcountry. From the moment you turn off historic Highway 61 to enter the moss-draped avenue of oaks, you are transported to another era. "Magnolia Plantation is the complete plantation experience," said Judy Hammill, who is in charge of tourism and public relations. "There is something for everyone," Hammill continued. Indeed there is. Just rambling through the almost 500 acres – there are hiking and biking trails – you'll come across remnants of plantation life such a street of slave cabins or the pre-Revolutionary rice barge. Several specialized gardens, including the Herb Garden and the Barbados Tropical Garden, are nestled on the grounds. And children will naturally gravitate toward the petting zoo and the maze. Despite the Rev. Drayton's efforts, Julia never fell in love with the South.